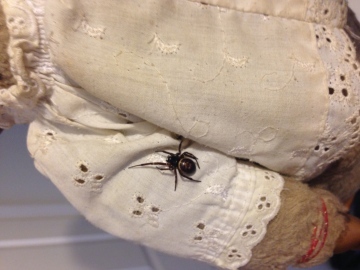 Re: Is this a false widow spider? This is certainly a Steatoda (false widow) species, and looks most likely to be Steatoda nobilis, the so-called 'noble false widow', the spider which the media make such an unjustified fuss about. It has been frequent in the southern coastal counties of England for a great many years, without causing any problems. It is nowadays frequent and abundant in many areas of southern England, see also summary page. The media frenzy caused by this spider is unwarranted. There are a number of other 'false widows' in Britain, some which are native or have been in the country for centuries, so there is a lot of misinformation about these spiders. Steatoda nobilis spiders are unobtrusive, have no interest in attacking humans and would only bite if they were put into a position where they do so as a defensive reaction. Honey bees and social wasps pose a far greater risk. You can upload a photo without giving a date, although as you have done here, if you want help with identification, then you need to give a date in the forum post, which you have done. You are asked not give a taxon name in the Subject field of the photo unless you are certain of the species. I have removed the subject from yours. When logged-on, you can edit your own photos at any time. Is this a false widow spider? Good morning, Firstly can I apologise I've uploaded the image without confirming what it is first, I didn't realise this was needed until afterwards, I tried to delete but it said I wasn't authorised. Also it wouldn't let me put a date in the title which was yesterday 16/02/2017. I'm just wondering if this is indeed a false widow spider, I've had many many since the first one ran across my stomach in October 2016 (after putting on clothes from my wardrobe) my window frames had 15-20 each window, my shed had one every 2 feet or so and apparently they have now taken up residence in my spare room. I normally just leave spiders to it I just leave them where they are as I'm not worried about them but these are making me a little nervous I have to admit. I've come to this page to firstly confirm exactly what they are and find some proper advice on their behaviour etc as I seem to suddenly have no visitors (other than spiders). My friends seem to think if they enter my house the spiders will run at them and bite them...in fact they seem quite sedate to me so far, I can pick them up (in a glass) and put them outside easily, in fact they seem to try to slowly walk away without being noticed.